We’d love your help. Let us know what’s wrong with this preview of Ice Diaries by Jean McNeil. A decade ago, novelist and short story writer Jean McNeil spent a year as writer-in-residence with the British Antarctic Survey, and four months on the world’s most enigmatic continent — Antarctica. Access to the Antarctic remains largely reserved for scientists, and it is the only piece of earth that is nobody’s country. I What do we stand to lose in a world without ice? To ask other readers questions about Ice Diaries, please sign up. I just love these meditative types of books and lately I have been attracted to books set in Alaska, the Arctic and the Antarctic. Such different places that are hard for me to imagine. Enjoyed that each chapter started with a description of a different type of ice, who knew there were so many. Also liked the clear and concise description of the differences between the Arctic and the Antarctic. The author meets so many interesting people, experiences so many different things, things that make her I just love these meditative types of books and lately I have been attracted to books set in Alaska, the Arctic and the Antarctic. Such different places that are hard for me to imagine. Enjoyed that each chapter started with a description of a different type of ice, who knew there were so many. Also liked the clear and concise description of the differences between the Arctic and the Antarctic. The author meets so many interesting people, experiences so many different things, things that make her ponder events and people in her own life. Took me to a place I will never visit except in books like these. This book has everything I can ask for when I read a work of what I like to call creative non-fiction - she interweaves her own experiences (past and present) with conversations with people within those experiences and multifaceted research. The writing is vivid and brings me into her world of ice and cold. The way she captures isolation, the effect a landscape has on a person, the thoughts that go through your head when you are trapped at the bottom of the world - it is very powerful. If it wer This book has everything I can ask for when I read a work of what I like to call creative non-fiction - she interweaves her own experiences (past and present) with conversations with people within those experiences and multifaceted research. The writing is vivid and brings me into her world of ice and cold. The way she captures isolation, the effect a landscape has on a person, the thoughts that go through your head when you are trapped at the bottom of the world - it is very powerful. If it were not an advanced reader copy I'd be adding a bunch of quotes to this review to show what I mean. 2,5. Za dużo autorki, za dużo niedomówień, za dużo histerii i paniki. Za mało lodu. I’ve long been fascinated by the thought of visiting Antarctica, and in the absence of any possibility of visiting, at present, I have instead devoured books by those who have visited and lived on this vast icy continent. This book is easily one of the most memorable and evocative I have read – both a travel story as well as a personal memoir. Moving from her past growing up in Canada, to time spent in Antarctica as year as writer-in-residence with the British Antarctic Survey, Antarctic, Jean McNeil. It is about coming to terms and processing that past, as well as some of the changes that can occur in you the longer you spend in Antarctica, and McNeil unflinchingly describes her depression as darkness sets in before an Antarctic winter. But time is also running out as global warming heats up the earth, and this book is both a warning of environmental damage, as well as homage to that strange continent. The language is achingly beautiful, a meditative book to be savoured and returned to. I found this a difficult book to evaluate. It is based on the author's 4 month stay In Antarctica ten years ago. She displays great poetic/literary talent in vivid descriptions of dazzling, changing colours on gleaming ice fields and ice bergs. I thought the book uneven and choppy in the transition of time, place and inner thoughts. There was some straightforward description of her time aboard ship and at the base, descriptions of the science of global warming she learned on her journey, and wa I found this a difficult book to evaluate. It is based on the author's 4 month stay In Antarctica ten years ago. She displays great poetic/literary talent in vivid descriptions of dazzling, changing colours on gleaming ice fields and ice bergs. I thought the book uneven and choppy in the transition of time, place and inner thoughts. There was some straightforward description of her time aboard ship and at the base, descriptions of the science of global warming she learned on her journey, and warnings of the danger this portends for the future. There is much introspection with memories of a drunken and violent family surroundings and impoverished life in Cape Breton. Later in what sounds like the Miramichi region she describes a killer stalking young women and encounters with her mysterious biological father. These passages are unclear and fragmented like a dream. The author describes herself as introverted and a loner. The narrative is full of melancholy. She feels, as writer in residence that she is out of place amongst scientists and the people are either younger and older than herself. She does build temporary friendships with a younger scientist who explains the science of ice, and an older pilot who teaches her to fly his plane. When these men leave the base she is depressed and subject to anxiety attacks. There are some hints of the supernatural. A fortune teller predicted before she planned her journey that she envisioned her among ice in a cold country. On her way to a second stay in Antarctica she suddenly abandons the project due to strong premonitions that her life is in danger. I would have preferred more description of the life and base and the workers there. I think most of the introspection and life story would make another book. I am an experienced Antarctic veteran. This is a memoir of an Antarctic experience by a newcomer. It is crammed full of rich prose. In the spirit of Wild, by Cheryl Strayed, McNeil withholds no secrets. This kept me reading. Her descriptions of the landscape are unique and unexpected, like the Antarctic. Many times I read them and said "yeah, that’s how it is," or, "I’d never thought of it that way." She devotes a good portion of book to revealing the characters she became close to. They are con I am an experienced Antarctic veteran. This is a memoir of an Antarctic experience by a newcomer. It is crammed full of rich prose. In the spirit of Wild, by Cheryl Strayed, McNeil withholds no secrets. This kept me reading. Her descriptions of the landscape are unique and unexpected, like the Antarctic. Many times I read them and said "yeah, that’s how it is," or, "I’d never thought of it that way." She devotes a good portion of book to revealing the characters she became close to. They are convincing in their own uniqueness. In a parallel story she shows the turmoil of her pubescent youth, and how she escaped it. Although compelling, I didn’t quite get the reason for this structure. It does show her strong character though, and makes you root for her. In the end she is telling the reader how the Antarctic changed her. Anyone who has been there under similar circumstances knows they’ve been changed, but most are not sure how. Her book joins the ranks of others that recounted visits to Antarctica by observers – not scientists and technical staff. I’m comparing this book to Antarctica by Gabrielle Walker, and Terra Incognita by Sara Wheeler. Wheeler’s is the best, but McNeil ties with Walker. All these books reveal a place where nobody belongs and from where no one really leaves. It took me some time to settle into this memoir/musing centred around the author's time as a writer-in-residence on a base in British Antarctica - it's slow-paced and contemplative (and somewhat too wordy) looping round and round the author's attempts to come to grips with the environment, its effect on her, and her eliptical interactions with others around her. But once settled, I found it absorbing and thought-provoking. Extraordinary place and well worth asking what it means to us. 3.5. I got irritated by this book and this author. I couldn't follow her timeline getting to the Antarctic and couldn't follow the story from her past. I didn't particularly like her, or maybe it was that I just couldn't get to know her. She wrote about her crippling anxiety, but so dispassionately that it was dull. I also couldn't buy into the whole "I have a gift for predicting the future". I missed the point of that. I hope she's a better fiction writer than non-fiction writer. Reading through the list of Banff Book Festival Winners, this one was tough for me to get to and to finish. The beginning was confusing, because I wasn't aware that she had had the opportunity to go twice! I have always wanted to go to the Antarctic, especially on a research ship on someone else's dollar. I would happily take a science (I have a chemistry degree) or writer position. If only Canada bought the station that the Ukraine got. As a consolation prize I spend a fair amount of time in th Reading through the list of Banff Book Festival Winners, this one was tough for me to get to and to finish. The beginning was confusing, because I wasn't aware that she had had the opportunity to go twice! I have always wanted to go to the Antarctic, especially on a research ship on someone else's dollar. I would happily take a science (I have a chemistry degree) or writer position. If only Canada bought the station that the Ukraine got. As a consolation prize I spend a fair amount of time in the Yukon. The book felt like it needed another edit to harmonize the past and present. Spending time in the north has always been particularly healing for me, so I can appreciate her self reflection on a painful past within the context of her isolation, but it wasn't well integrated for the reader. Loki was a weird, rushed addition with little connection to the rest of the story. I realize that he reflected what she saw in her father, but the relationship or lack thereof needed more exposition or to be cut out entirely. On the other hand by knowing the challenges she faced as a child, I could understand how she acquired the skills to secure TWO highly competitive spots to the Antarctic. I just wished it flowed better. At the Banff festival they talked about her ice climbing experience that started in the Antarctic, which I patiently kept reading until I found it towards the end, though she had mentioned the training when they reached. I enjoyed her accounts of the young explorers/mountaineers coming from exotic trips to attend the preparatory meetings and was proud that the writer could also venture out into the unknown to use her new skills. I'm sure she surprised many people on her second trip with her knowledge of knots and equipment. OF COURSE it will not be available there. And what for?? And why would you assume such a thing? Because that is how we save the planet and the the Antarctica, right? By delivering - by plane - some stupid magazine to the other half of the Earth.Yup, that is how we are going to solve the issue. Why do you think the ice is melting? Exactly because we are afraid to go out of our comfort zone. I just cannot stand when people travel to the other part of the world but expect everything to be the same. So what is the point of travelling? A disappointing conglomeration. The text oscillates between Antarctica and the author's childhood in coyly unnamed Canadian locales. The Canadian sequences should have been most interesting, but the lack of specificity and lack of relevance to Antarctica made them eventually unreadable. I started to skip them and once that happens the book is essentially done. Much of the Antarctica descriptions are beautifully done, but this book as a whole just did not come together for me. I am an Antarctic-tragic...can't get enough and my interest, curiosity, fascination is abiding and could possibly be verging on obsessive. I have faced the fact that it is VERY unlikely I will ever set foot on the continent. My personal library includes many books on the subject. This book however is the first one I have read from the point of view of an 'embedded' writer, whose sole purpose is to write from personal experience, over the course of the Antarctic summer. What a brainwave of an ide I am an Antarctic-tragic...can't get enough and my interest, curiosity, fascination is abiding and could possibly be verging on obsessive. I have faced the fact that it is VERY unlikely I will ever set foot on the continent. My personal library includes many books on the subject. This book however is the first one I have read from the point of view of an 'embedded' writer, whose sole purpose is to write from personal experience, over the course of the Antarctic summer. What a brainwave of an idea to do this! Finally, a spectacular landscape, an astronaut-like experience in an extreme environment and a skilled writer delivers this experience to the reader with deft subtlety. BLISS!! Can some clever person please keep this concept as an annual event? What about a skilled writer embedded over winter?? So much to love about this book...the scientific mind versus the literary mind...the author seems to be deeply unnerved by the emotional effect the isolation begins to take on her (and we gain insight into the creep effect of the Antarctic and imagine the same on ourselves). I can't say I found the final chapter of philosophising very readable or satisfying, but that's OK. I may need grit and reality but others may have found this epilogue type conclusion necessary. Also, the dream like sequences where the author slipped into personal musings about her childhood and fractured relationship with her father were both enjoyable reading (in any other setting), but annoying where all I wanted to hear and read about were the Antarctic. As well as the literary insight to the Antarctic, I enjoyed reading about the day to day practicalities...understanding what PNR means (Point of No Return), the tag system of keeping tabs on who is where and when at all times, the elite aura around the pilots, and the hide and seek game played by cruise ships visiting the Antarctic so as not to shatter the illusion of exclusivity were just some of the detail I enjoyed. Yawn. I ploughed through a third of this book, but DNF. Antarctica is probably my most favourite place to read about, but up to this point my reading has been largely confined to the books by/about the Antarctic explorers of the early 1900s (like Shackleton, Mawson, Scott, and Amundsen) and I was quite keen to read a contemporary take on the continent. So when I saw Jean McNeil’s Ice Diaries on NetGalley, it seemed like the perfect starting place. Ice Diaries goes beyond McNeil’s Antarctic experience and touches on her past as well, specifically the f Antarctica is probably my most favourite place to read about, but up to this point my reading has been largely confined to the books by/about the Antarctic explorers of the early 1900s (like Shackleton, Mawson, Scott, and Amundsen) and I was quite keen to read a contemporary take on the continent. So when I saw Jean McNeil’s Ice Diaries on NetGalley, it seemed like the perfect starting place. Ice Diaries goes beyond McNeil’s Antarctic experience and touches on her past as well, specifically the final years of her living in Nova Scotia during her late teens. While I had a preference for the Antarctic aspect of the book, I liked reading this other part as well as it gave me a bit more of an insight to the writer herself. These moments of her teenage years appear at the end of each chapter and read almost like a fictional mystery/thriller type book – there’s a murderer, the arrival of an estranged father, and some fairly horrible family experiences in general. These parts were dark in comparison to the brightness and perpetual daylight of the Antarctic summer experienced by McNeil. Like all stories of travellers to the Antarctic, it starts with the journey to get there. It’s much faster today than in it was in the time of the explorers, but it still, for McNeil at least, involved spending weeks on a ship to get there due to the scientific research that was undertaken en route. I liked reading both aspects of this book – the darkness of McNeil’s earlier years in contrast with the brightness of the Antarctic. But at the time of reading it was difficult for me to connect the two threads of the story – they seemed like they wanted to meet but never quite did, making the whole thing feel disconnected and like there was something missing, in turn making the book a little difficult to read at times. On reflection, however, I can see a parallel between the two sections, namely the fact that in both McNeil’s life is disrupted and she is taken out of her comfort zone – in the first instance by the arrival of her estranged father in her teenage years, and in the second by the very fact that she left everything that she knew to go and live in one of the most isolated places on earth for four months. Along with that, she’s a complete outsider among the other residents, most of whom are scientists and who largely frown on her presence as, in the minds of many of them, she doesn’t seem to contribute anything by being there. This compounds her loneliness in the latter stages of her trip, thus impacting on her mental state; so as it turns out, even perpetual light has its dark points. The reason I picked this book up was because I love that combination of geography, history and science but from a writer’s perspective. This is why I have collections of national geographic magazines in my shelf. As a scientist myself, reading scientific occurrences from a writer’s POV is a fresh change from all the technical jargon and this book provides exactly that. But if you are looking for a purely scientific or a travel account, this is not for you. McNeil chronicles a lot of her life experiences growing up and the feelings she experienced living in the most inaccessible and remote continent on the planet. Although I feel that sometime McNeil was a little too repetitive with her descriptions of the continent. But then this is a memoir so I felt it was justified. Part 1: This part describes the McNeil’s journey to the Antarctic via the Falklands; the troubles the ship had to face and the drastic change in scenery and lifestyle. There is also a large portion dedicated to the author’s personal life involving mainly her interactions with Max the brooding physicist; his cynical views contradicting her writer’s imagination and creativity. Part 2: The merry band of scientists, military personnel, technicians, engineers and writers finally reach the continent and have to now deal with the stark conditions. She also mentions other literature regarding previous voyages to the Antarctic, especially Shackleton, Scott and Amundsen, which was interesting to read. I especially loved the inclusion of definitions of various terms for ice at the beginning of each chapter. Frazil ice, Sastrugi etc. ‘Meanwhile the north end of the runway was still claimed by outraged mother Skuas who dive-bombed me. I ran with the shadows of these miniature pterodactyls swirling around my head, flailing my arms in a polar version of “The Birds”’. And some were hauntingly scary, like the case of pilots who lost control of their planes because their brains couldn’t differentiate between the white expanse of the land and the sky. All in all this was a varied and enjoyable read. Had to take this out of the library twice as I couldn't get through it the first time (too... much... ice.... I live in Eastern Ontario and winter takes up half the year, it feels like)... but then I couldn't get it out of my mind, so borrowed it again to read the second half. P. 235 (secrets beyond our human perception): "...suddenly I shot up into the highest layer of the atmosphere, and beyond, into space, Had to take this out of the library twice as I couldn't get through it the first time (too... much... ice.... I live in Eastern Ontario and winter takes up half the year, it feels like)... but then I couldn't get it out of my mind, so borrowed it again to read the second half. P. 235 (secrets beyond our human perception): "...suddenly I shot up into the highest layer of the atmosphere, and beyond, into space, from the starless Antarctic sky. Strange entities were there, huge and transparent. They knew what was happening, and what is supposed to happen, and what will happen. They knew everything. This journey took a moment, too fast for my brain to record. I knew only that a high-voltage current of knowledge had surged through my mind. And then it was gone." P. 240 (dear memories of flying in the high Arctic with my partner in a small Cessna over endless tundra): "... I can't really explain the raw serenity I felt. Tom felt the same ... 'You know, I never think of crashing,' he said .... 'I know,' I said, 'I feel it too.' That somehow we were protected." I remember feeling that I could happily crash and die, though we wouldn't somehow, at that time and in that place, suspended over the glorious landscape, with the curve of the earth highlighted by evening sun. P. 245 (wondrous notion of reincarnation): "I feel I will meet my father again in the future. By then I will be someone else, and he possibly will be too ... But we will know each other still our hearts will thud against our chests painfully, with a spasm of recognition. We will confuse what we feel with fear and we will want to hurt each other." P. 290: "In the Antarctic, for the first time in my life, I began to think such a universal mind might exist. I could feel it in the land. It felt neither malevolent nor benevolent, rather regally indifferent." P. 307 (life versus dreams versus other lives): "I begin to believe ... I am narrating my life from the dead, or beyond the grave. I believe I am alive, but am already in the next life. This life is the dream, and the dream I had about my father and the river [he let her drown] is real." Although the synopsis describes it as a memoir, but “Ice Diaries” is more than that, or at least it tries to be. Much more science and detail-heavy than promised, the book nonetheless strives to introduce the reader to the Antarctic lifestyle in all its vastness, both the exciting parts that deal with how people interact and the social lives they lead, to the more complex and at times frustrating, the descriptions of machinery or procedures and protocol. 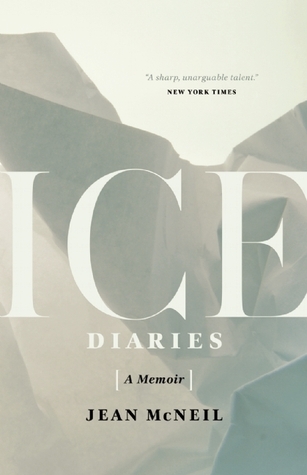 The book brings out the distinction betwe Although the synopsis describes it as a memoir, but “Ice Diaries” is more than that, or at least it tries to be. Much more science and detail-heavy than promised, the book nonetheless strives to introduce the reader to the Antarctic lifestyle in all its vastness, both the exciting parts that deal with how people interact and the social lives they lead, to the more complex and at times frustrating, the descriptions of machinery or procedures and protocol. The book brings out the distinction between the science-oriented and the humanities-oriented readers significantly, but does an admirable job at attempting to mediate between them, providing now only the author’s thoughts and personal background but also adding that realistic depth to the events. It is with the first aspect that the main problems with the book are tied to. The order and shifts in narrative aren’t the greatest. It took some time to realize that the “bookend” of each chapter was dealing with the author’s earlier life, describing her situation with her grandparents, her mother, and later the appearance of her father. It was a good attempt but not entirely a successful one, sticking out from the rest of the book in a way that made this earlier personal narrative feel more like a possibility for a separate memoir. It also felt like the enthusiasm and engagement of the author with her own writing. The pacing gradually gets choppier – the reader isn’t left with a way in which to evaluate her father, for instance. There is the sudden jumping around in time that occurs in the last 10% or so of the book, particularly with the brief introduction of the character of Loki. While it’s easy to understand the sentiments and how they relate to the theme of the Antarctic and ice, part such as the Loki memory stood out and made it difficult to evaluate the book as a whole. This book surprised me at how charming I found it, although it took finishing the book, and taking some time to digest what I had just read for me to come to that realisation. I have read a number of biographies of Ernest Shackleton and other Antarctic explorers, including some of the works referred to in this book, and I guess I was expecting something more adventurous. Ice Diaries is the author's journey - nominally as a writer, although she spends more time talking about not writing - to Antarctica as a writer-in-residence, where she spends a number of months as something of an outsider amidst the scientists, technicians, mechanics and others who share this lonely corner of the world. It is an almost spiritual journey, as a fair portion of the book is given over to memories of the past, including a good many regrets. I felt like she could get a little heavy handed at times with some of the philosophical aspects of the book, and every time she skipped away down memory lane (often without warning, at least in my copy) I was left wanting to find more information about the 'present' such as was being told at the time. I guess there are few great mysteries in the world left to explore, and even the great untamed continent at the bottom of the world has become increasingly accessible through the use of high-powered aircraft and ships. Even in this far away place there are still many of the comforts of home, and civilisation has taken root - to some degree, unless it's winter. The thrill of adventure came through in the writing when the author ventures outside that comfort zone of home and into the world outside the base, but it's a little bit too infrequent. An enjoyable read, and would be of interest to fans of memoir, and the romantic in us. I have read a few books about travels to the Arctic, but never one about the Antarctic. When I heard about Ice Diaries, by Jean McNeil, a writer from Nova Scotia, who was selected to travel to the Antarctic with a British scientific team, I knew I had to give it a read. The book was very interesting but more eloquently written than I expected. At first I thought it would take away from the adventure of the story, but as I read on found, the eloquence actually added to it. McNeil not only tells the I have read a few books about travels to the Arctic, but never one about the Antarctic. When I heard about Ice Diaries, by Jean McNeil, a writer from Nova Scotia, who was selected to travel to the Antarctic with a British scientific team, I knew I had to give it a read. McNeil not only tells the story of being in the Antarctic, but of the voyage and the personalities involved getting there. In most chapters she also tells the story of her growing up in poverty and abuse in Cape Breton. I was wondering how this related to her trip to the Antarctic, but it all ties together in the end. ARC from NetGalley - thank you. Immediately after reading Ice Diaries, I felt it was a 3 star book, but I sat on the review for a while to give myself time to consider things a bit further. This was because it was rather different to the norm and I wanted to give it a chance to grow on me. Well, it did. I've amended it to 4 stars. Ice diaries is part memoir, part scientific stuff about ice, and part Jean's recounting of what must have been an unforgettable few months in the most forbidding landsc ARC from NetGalley - thank you. Ice diaries is part memoir, part scientific stuff about ice, and part Jean's recounting of what must have been an unforgettable few months in the most forbidding landscape on earth. As it was a galley copy, the moves from present to past were somewhat sudden and clumsy, but I'm sure in the published book that's been sorted, but the underlying narrative of Jean's difficult childhood and adolescence was engaging. The prose about Antarctica was fascinating, and the reason I requested Ice Diaries in the first place. I'm highly unlikely to ever go, so a vicarious report is the nearest I'm likely to get to seeing the gleaming vistas for myself. I suspect that it's hard to understand what it's like in Antarctica unless you've been there - McNeil tells us this throughout The Ice Diaries - but her descriptions, both of the physical landscape and her own reaction to it made me, as the reader, feel that I might have been given some understanding. She writes quietly and without arrogance. This is a beautiful book and McNeil's elegant, vivid language is a treat to read. I won this in a Goodreads giveaway. My opinion is just that...mine...and completely unbiased. First let me say that I did not finish this book. I tried, but only got about half way, and had to throw in the towel. Ms McNeil is obviously a very good writer, but I found this to be tedious and muddled. It could just be that I was expecting coffee and was served tea, but I am sure there are many to whom this would suffice. Fascinating book on many levels: Antarctic travelogue exploring climate change, a very personal memoir, and a detailed exploration of how we connect with the world and our fellow human beings. The editing for grammatical and other errors could have been more rigorous, but that's not the author's fault, and doesn't really impact the narrative of the work, which is compelling. This is a Goodreads win review. I just loved this book. I love to read books where I learn something. This author spent a year as a writer in Antarctica. This place is the only place on earth which is nobody,s country. She also spent time in Greenland, Iceland, Svalbard and Cape Town. Her book is part about her travels, science and her memoir all in one story. It is a very good read. I started reading this book but did not read the entire book. It may be an eloquent, descriptive story but I simply lost interest in the story after reading a few chapters, I read some parts of the remainder of the book, but skimmed through most of the chapters. A rare combination of Antarctic science and human and literate experience of the place, without the usual survivalist point of view. Myślałam, że ta książka będzie lepsza. Czytałam lepsze reportaże o lodzie, Antarktydzie czy Arktyce. Beautifully written and compelling personal account of a writer's experience in Antarctica.